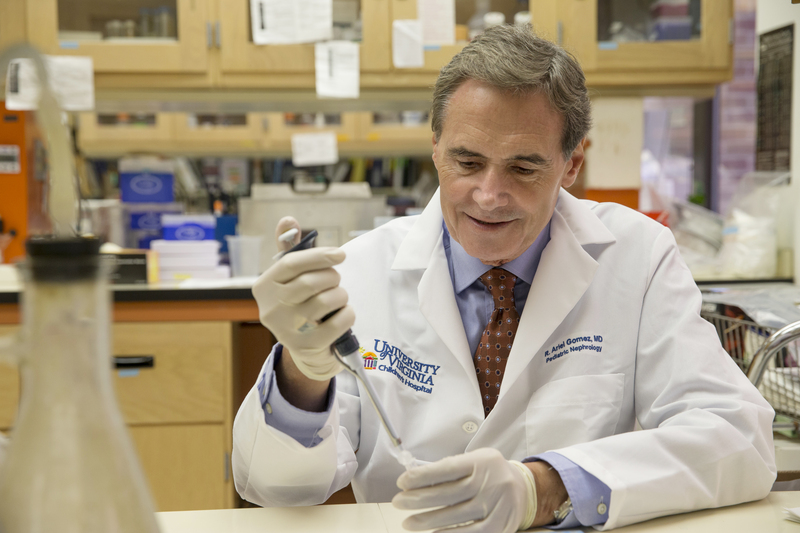 UVA's Child Health Research Center (CHRC) brings together scientists and clinicians to uncover the fundamental causes of childhood diseases and to pioneer new treatments, personalized therapies, and cures. Dr. Ariel Gomez (left) directs the CHRC. Curing disease begins in the laboratory by uncovering the causes and processes of illness. Lab discoveries move to the clinic for testing therapies and formulating new questions. The CHRC promotes collaboration and innovation across the research spectrum and holds great promise for changing how we treat many common childhood diseases. The Center addresses health issues ranging from childhood asthma to kidney disease, diabetes, premature birth, obesity, infectious diseases, cancer, and vascular disease. Through the Center, promising discoveries can move quickly from the research lab to children in need. As its primary goal, the CHRC seeks to discover new knowledge that will change children's lives through improved healthcare.